It all began with a Wednesday night poli-sci class. I’m not going to lie, the story of how I've reached this point traces back to sheer laziness. I might never have ended up here if I wasn't a teenager who liked to sleep in. 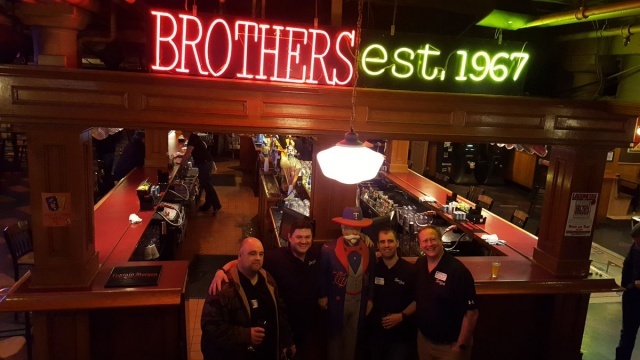 This story is part of a series from the Twins Daily owners sharing their personal feelings and reflections on the site in honor of its five-year launch anniversary – which happens to fall today, February 19th! You can also read Seth's retrospective on a path that began with Seth Speaks, John's inside story of Twins Daily, and Brock's writings on the challenges and successes of merging his own online forum into TD. In fall of 2004, I was a freshman at the University of Minnesota. When the time had come to select classes over the summer, I was fascinated by having the ability to completely structure my own schedule. A night class? That's one less day I have to wake up early. Wednesday evenings at Political Science 101 sounded marvelous when I lined it up, but less so when the Twins – owners of my diehard allegiance since childhood – matched up against the Yankees (again) in October. Behind a masterful outing from Johan Santana, Minnesota had taken Game 1 in Yankee Stadium. Despite the magnitude of Game 2, I dutifully trudged across Washington Avenue Bridge to Anderson Hall on the West Bank. The downside of these three-hour night classes (aside from them being three-hour night classes) was that you could not afford to skip one. You needed to be there, and paying close attention. So naturally, I got there, pulled out my laptop, popped on the GameCast, and tuned out. My exaggerated reactions to innocuous updates on the screen probably would have given me away, but fortunately I had a cohort. Another guy in the class turned out to also be a pretty big Twins fan. His name was also Nick. We covertly followed the action until the professor got done lecturing, and then I rushed home to catch the end of the game. You might recall how this one played out. The Twins tied it late and sent it to extra innings. Torii Hunter hit a go-ahead homer in the 12th. Joe Nathan – visibly gassed – was sent out by Ron Gardenhire for a third inning of work, and he gave it away. I was mad. I had... OPINIONS. So did my pal Mr. Mosvick from Poli Sci 101. When spring training rolled around the next year, we decided to start writing about the team online. We called our little venture “Nick & Nick’s Twins Blog." I went to journalism school at an interesting time, hearing in one ear about how to write in inverted pyramid format and work within physical page space constraints, while hearing in the other ear about the impending doom of the newspaper medium. Nevertheless, my innate passions for writing and sports led me down the path of reporting and covering games. I got a gig covering the Gophers men's hockey team my junior year, enthused about getting free entry to the game and inside access. I can thank David McCoy, always a grinder and now a WCCO sports reporter, for giving me the opportunity. He's currently living out the dream that I once thought I shared. But then I did it a few times. I found myself stifling reactions to goals in the press box, in observance of the unwritten code. I frantically worked through tech problems while recording or editing. I lamented deadlines, rooted against overtime, treasured an easy story over a compelling final twist. In short, I came to a painful realization: once it became work, it was no longer fun. Baseball, and sports in general, were my diversions from the rigors and stresses of forging a career. It didn’t take long for me realize I didn’t want to make them one and the same, especially if meant trying to break into a newspaper industry steeped in uncertainty. Besides, around this time I was developing much more of an interest in the online tribes of smart and engaged fans that were starting to gain traction. My fascination with baseball grew as I aged into my mid-20s, fueled by the razor-sharp analysis at AaronGleeman.com, the unapologetic embrace of the inner nerd at Twins Geek, the informative prospect reports at Seth Speaks, the endless banter at Stick and Ball Guy, the gut-busting message board snark at Battle Your Tail Off. The level of commitment required for these side hobbies ended up derailing many a promising blog. I was heading in that direction myself, finding it increasingly difficult to justify carving out the time it took to research and write worthwhile stories. After I graduated from college, my little blog kept rolling along. The other Nick had gone off to law school so it was just me running the ship, trying to post at least a few times per week. There were many rewarding moments that fed my resolve. Readership steadily increased, to the point where many regulars faithfully checked in daily, often providing their own enlightening insights. 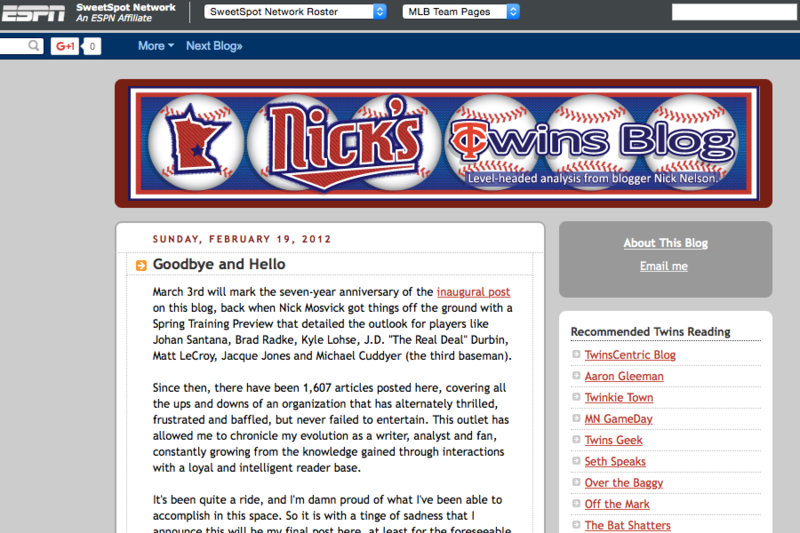 In 2009, Rob Neyer reached out to me personally and invited me to represent the Twins on ESPN’s SweetSpot blog network – an incredible honor. Most importantly, I began to develop relationships with some of those pioneering fan bloggers who had inspired me. John’s long-running desire to make something more out of this whole venture, rather than falling by the wayside like so many, was something I bought into. So did Seth and Parker. I had the pleasure of getting to know all three over the years. Guided by John’s entrepreneurial vision, things evolved naturally. We started joining forces to create and sell books and premium digital content. We organized events. Eventually, we reached the inevitable conclusion that it was only logical to combine our four blogs into one central go-to destination. Twins Daily was born. Shortly after it launched, Brock joined the fold, adding technical expertise we desperately needed while also bringing along many of my favorite personalities from BYTO. It was a pivotal turning point for our forums, helping them develop into the single most indispensable part of the site. People compliment me about Twins Daily often, and it's always appreciated, but there is one endorsement I hear more than any other. In the age of "DON'T READ THE COMMENTS," here they are a highlight of the experience. I'll never forget my dad, an old-school type who I would never expect to keep scanning beyond the end of an article, one time telling me how much he enjoyed the comments on my stories, and how much more he learned about the subject from them. It was the common goal, in all of our eyes: bringing together the cohesive energy, knowledge and passion of this huge population of Twins diehards in Minnesota and across the country. Still today, five years later, this community manages to surprise me. When I log on and see 100 comments on an inane offseason post, or show up at the Winter Meltdown to a packed house of enthusiastic faces, or see dozens of people voluntarily chipping in more than the expected contribution to download an Offseason Handbook, it's all the justification I need to keep pouring my heart into this thing. And yeah, the fact that we've managed to turn Twins Daily into a business, albeit a modest one, is rewarding. My incredibly supportive girlfriend Rachel, who I'm lucky enough to live with, recently told me how vividly she recalls the first time I opened a letter from John and pulled out a check compensating a few hundred bucks for contributions to the website. "I can't believe I get paid for this," I told her. That was awhile back now, but the feeling hasn't changed. It's not my full-time job. It probably never will be, and that's OK – I'm happily building a career in content marketing that brings great variety to my days and keeps baseball writing in the "side hobby" category where I always felt it belongs. But at this point that description hardly feels fitting. Twins Daily is an important part of my life. I hope it'll stay that way for another five years and beyond. Mine is a strange tale of finding a platform in the new age of digital media. It wouldn't have been possible if I'd come along 10 years earlier, or if I hadn't been fortuitous enough to encounter just the right people along the way. I am very lucky and recognize that everyday. But there's a takeaway here that, I think, is applicable to everyone. If you love something, wear it on your sleeve. Don't be secretive about the nerdy passions that make you happy. If I hadn't been so frontal about my love of the Twins and baseball, I probably never would have met the other Nick in that Wednesday night class, nor would I have met John, Parker, Seth, Brock or any of the numerous other people involved with Twins Daily that I now consider close friends and cherished colleagues. And also, don't be afraid to sleep in. "...The old saw about the early bird just goes to show you that the worm should have stayed in bed." Really nice article. And extremely well written, I might add. Thanks for sharing your journey with us. Thanks for allowing us to walk along with you. For some reason, I always get the impression Nick actually resembles Ricky Vaughn. Minus the tats and prison term. I thought it began with Brian Buscher. What a fantastic way to cap off this series of articles. Nick, it's hilarious you began writing after that fateful Nathan night against the Yankees. It's one of my most memorable Twins nights, though not because I was watching the team. I had a crew of friends in Long Beach from Boston; so much so that we actually called one of them "Boston" because his accent was so thick we couldn't understand half the **** he was saying. I can't even remember the guy's real name even though I worked with him for two years, though his brother Mike was a true baseball aficionado (as only one from Boston can be). Well, that night we secured tickets for the Angels/BoSox series because of course we did. We were in the right field bleachers at Edison, heckling the living crap out of Vlad because, well, because he was there and so were we (we all loved Vlad but hey, he played for the Angels that night). The night was getting on swimmingly; the Red Sox were beating the living piss out of the Angels and the Twins tied it up against the Yankees. Then the time difference kicked in. The Twins took the lead and we went nuts. We actually got the entire right field bleachers (full of Bo Sox fans, naturally) going nuts, screaming "**** the Yankees". We were in pure bliss. Then Nathan came out again and it all fell apart. To be honest, I barely remember anything that happened after that point in the night. Unsurprisingly, I did not make it to work the next day. It was a mix of celebration (Mike and Boston) and consoling of defeat clutched from the jaws of victory (me). I think you mean Harrischer, no? In retrospect, arguing the merits of a Buscher/Harris platoon versus a barely upright Joe Crede represents a low point of my time as a both a blogger and Twins fan. I could have mentioned that in the story but things would have turned real depressing, real quick. I'm trying to keep it uplifting here, guys. Very interesting Nick, thank you. You and your equally odd and focused partners have put together a site that fills, well, not a need, but an avenue of entertainment that we take seriously. I still appreciate TenthInningStretch, TwinkieTown, TwinsTrivia, OffTheBaggy, etc., but this is my go to place. A great cure for the depression I was spiraling into upon the retirement of Bat-Girl. But you were right about Nishioka! Does that help? I was right about Crede too, given that his body proved to have a whole 90 games total left in it. But who's keeping track? I'm gonna be honest, I never knew I joined this site in the same year that it started up. I actually thought it was 3-5 years old already... now I know! There are some most websites where "DON'T READ THE COMMENTS" definitely comes into play... Looking at you, Start Tribune / Facebook / ESPN! This is definitely not one of those places. Hell, sometimes I don't even read the OP and jump in when the comments veer off in another direction. And then mercilessly rake it off. It's funny looking back on TD now, because I don't truly recollect when I started following/reading full time (probably one to many times smacking my skull into hard objects in Iraq and Afghanistan). To me, I love the sense of community it brings and have grown increasingly fond of just not the great coverage, but the active and passionate fans that inhabit its halls. So thanks for all you do... and the desire to sleep in some mornings!